BBC NEWS | Americas | Analysis: All change for Washington outlook? Analysis: All change for Washington outlook? The next US administration's foreign policy will not be decided simply by the outcome of the race between George W Bush and Senator John Kerry. Would a re-elected President Bush keep Rumsfeld and Rice? Even if Mr Bush were to be re-elected, the direction of US foreign policy is by no means clear. Would it be business as usual in Washington? Or, would a significant change in the foreign policy line-up lead to a shift in Washington's approach towards the world? Even from within Republican ranks, strong criticism has been directed at Mr Bush's handling of foreign affairs, most recently by Brent Scowcroft. When George W Bush's father was president, Mr Scowcroft was the White House national security adviser. And now he has had some unpleasant things to say about the younger Bush's stewardship over US foreign policy. Mr Scowcroft told the Financial Times newspaper that George W is mesmerised by the Israeli Prime Minister, Ariel Sharon; that the Bush administration's current efforts to enlist UN and Nato help in Iraq and Afghanistan are a desperate move to "rescue a failing venture"; and that America's unilateralist stance had contributed to the decline of the Atlantic alliance. Mr Scowcroft's blunt remarks are a reminder that there is a very different strand of foreign policy-making in the Republican Party that is struggling to re-emerge. It could be dubbed the realist or pragmatic wing - the foreign policy establishment of Henry Kissinger, James Baker and others - that has dominated Republican thinking on foreign affairs for much of the past 30 or so years. This tradition was eclipsed once the younger Mr Bush came to power by a new ideologically tinged grouping of intellectuals - the so-called "neo-cons" or "neo-conservatives" who, especially after the events of 9/11, seized upon the opportunity to push US foreign policy in a new and more unilateralist direction. 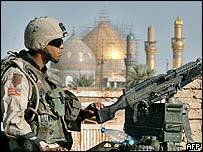 However the neo-cons have been tarnished by America's mistakes in Iraq. And their programme to bring democracy to the wider Middle East looks increasingly over-ambitious if not utopian. There is no doubt that the neo-conservatives are under something of a cloud. But equally it is far from clear that, if Mr Bush were returned to the White House, they would necessarily be shifted to the margins. 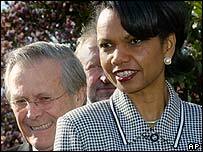 What post might Condoleezza Rice be offered? Would she stay as national security adviser? Mr Bush certainly values her skills but many experts question whether she has provided the cohesion and co-ordination to foreign policy that is a key element of this job. Would there be any post for Donald Rumsfeld's controversial deputy in the Pentagon, Paul Wolfowitz? And what of Mr Rumsfeld himself? In some ways, for all of the focus on foreign policy in this campaign - by which Americans really mean security - the various statements and pronouncements mean little. What matters is who wins in November and then who gets the key jobs when the new administration takes office next January. It is clear, for example, that the Pentagon has eclipsed the State Department in the handling of critical areas of foreign policy like Iraq and Afghanistan. Will the more traditional relationship between these two great departments be restored even if Mr Bush wins the race for the White House? In short, Mr Scowcroft's comments are a signal that even if Mr Bush wins in November, there are those within his party who wish to re-assert a more traditional Republican view of America's engagement with the world. They will be bolstered by many of the president's key domestic political advisers who are reportedly seething that the neo-conservatives' "adventurism" abroad, as they see it, has turned what should have been a Bush walk-over into an electoral race that is still too close to call.